At Candy Direct, we love a good surprise. We love surprises so much that we're giving away 20 pounds of candy for every customer, today only! Just kidding, we can't do that. We do have an interesting "surprise" roundup post for you today, though. 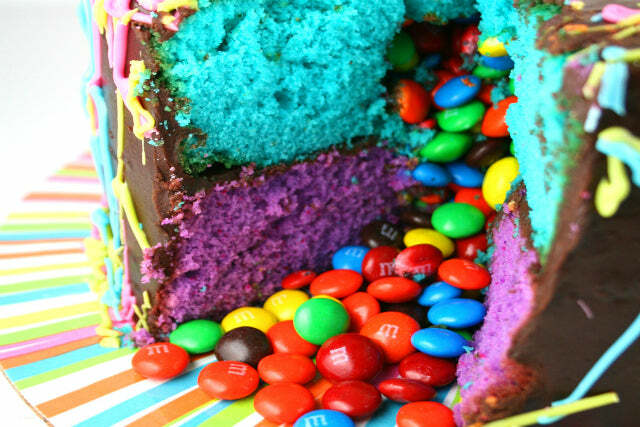 We've collected some of the most unique adaptations of pinata cakes. 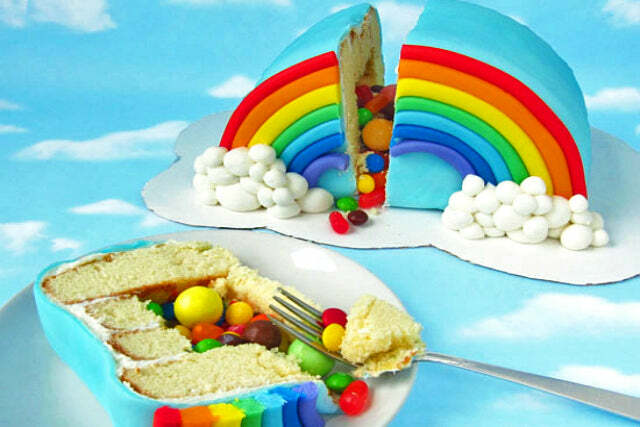 If you're unfamiliar with the concept, it's when you hollow out a cake and fill it with candy so that when you cut through it, the candy cascades out like a pinata. We know what you're thinking, and yes, we wish that we would have thought of it first, too. We picked out some of the most unique pinata creations, including 3 super adorable Halloween recipes because it's never too early to start planning for Halloween. We had to put this one first because...well, look at it. It's a thing of beauty. Beth from Hungry Happenings came up with the adorable idea and decided to show it off on Tablespoon. We love that she included some different size candy. She also has some fondant skills, so if that kind of things scares you away, you can probably use rainbow Twizzlers for the rainbow and marshmallows for the clouds. Lucy from Capture by Lucy took the glamorous route for these mini pinata cakes. She even uses rose water in the recipe, nothing is more glam than rose water. Lucy chose not to fill the mini cakes with candy, but instead used some sprinkles and freeze-dried raspberries. We can totally see these being served at a posh bridal shower or a mid-day tea party. Victoria from A Subtle Revelry originally made this pinata cake and it was such a hit that she decided to shrink and simplify the recipe for those events where knives and forks are too much of a hassle. We can appreciate the subtlety of these bite-sized treats. 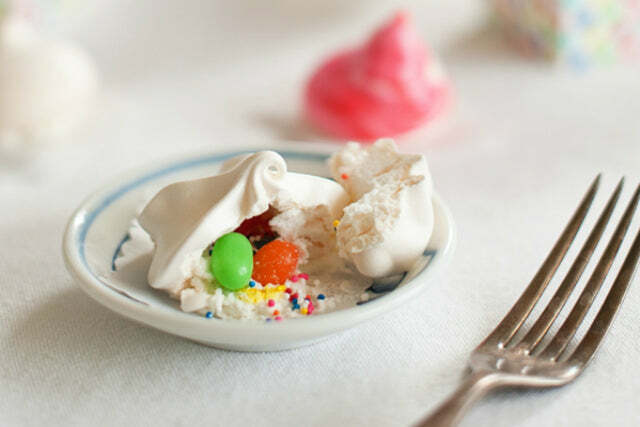 We're pretty sure that no one would expect there to be tiny treats inside of the already tiny meringue cookie. Check out the (surprisingly simple) recipe here! There isn't a recipe to go along with these adorable ombre pinata cookies, but we had to include it because they look so much like macarons. Plus, if we ask Amanda for the recipe nicely, she'll probably give it to us! We're big fans of the ombre color scheme, especially when it involves pastel. Also, since we have noc lue how to make macarons, it's good to know that layering soft, crumbly cookies on top of eachother will create a similar effect. Check out the gorgeous photos here! Is it too early to start talking about Halloween? We didn't think so. 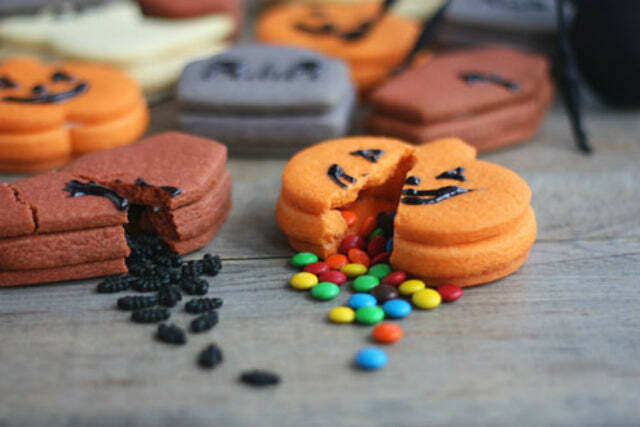 This tutorial from Megan at Not Martha shows you how to make pumpkin cookies with M&M's inside and tomb cookies with candy bugs! Mmmm. While we don't recommend passing these out to any trick-or-treaters this year (you know, because moms will totally think the "surprise" is a razorblade) they're a great idea for a Halloween party, or to send off with your kiddos to school. This adorable cake by Miso from Miso Bakes is one of the most creative cakes we've ever seen. 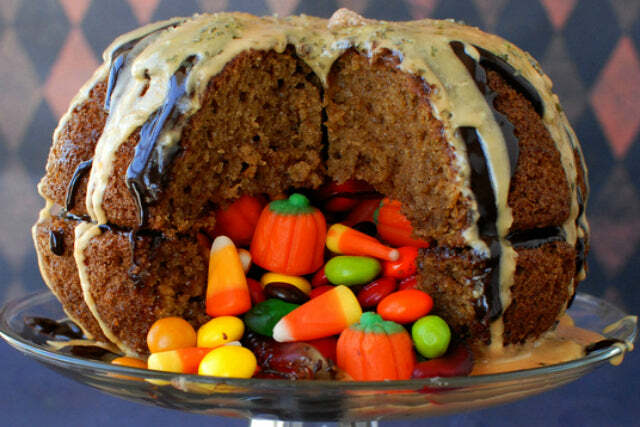 The pumpkin "pail" is made by using two bundt cakes with candy inside of the open center. No hollowing out any cake on this one! Simply make the cavity larger than it is, so you can fit more candy inside. 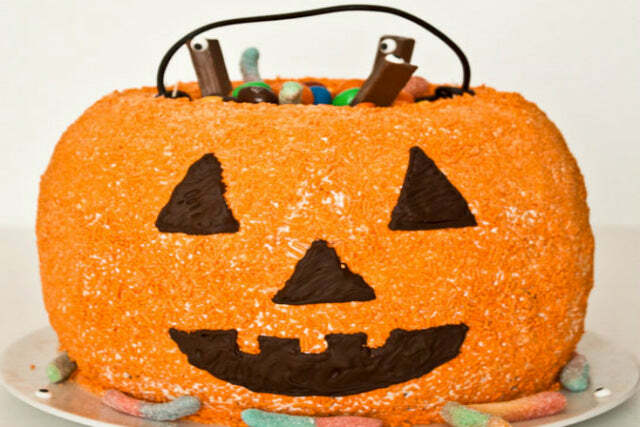 Here's another fall or Halloween cake recipe that packs a sweet surprise: "the great pumpkin" pinata cake! It's a pumpkin spice cake shaped like a big pumpkin-it would be a fabulous way to bring in the fall. Toni from Boulder Locavore uses some specialty round pans for this recipe, but you could probably use bundt pans like the pumpkin pail recipe. This 2-layer pumpkin spice cake is held together by a decadent chocolate ganache and covered with an orange-colored vanilla glaze. Because it's not just about the surprise candy inside, it's about the cake, too!! Can you tell that we're excited for fall and Halloween? Because we are. And we probably won't get around to make half of the things we've pinned on Pinterest already. 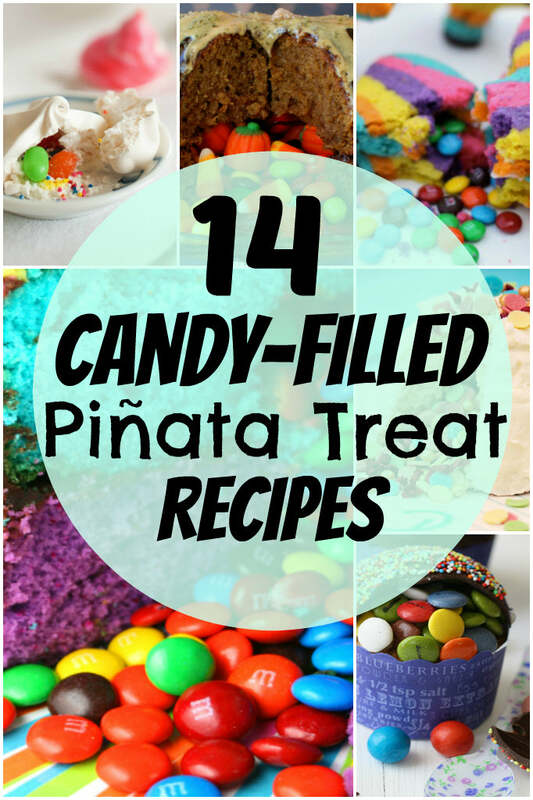 Dawn from Homemaking Hacks understands this, so she made a lazy baker's approach to pinata treats. These Halloween cups are made with frozen pancakes baked in a muffin tin. Can't say we would have ever thought of that. 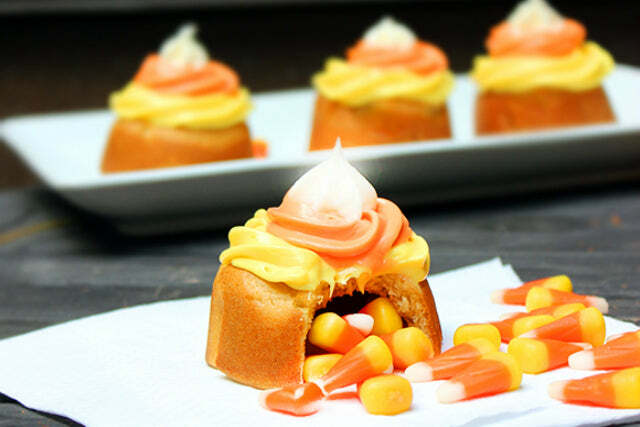 Flip the pancake cups over, top with "candy corn" icing and hide some candy corn underneath for a super quick and easy peek-a-boo treat. Check out this super simple recipe here! 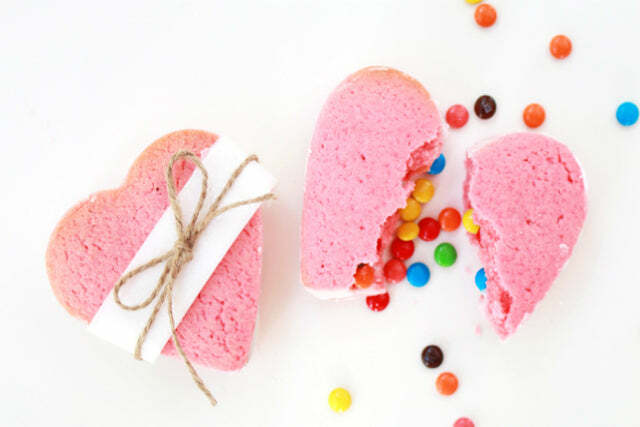 These heart cookies were originally made for Valentine's Day, but we think it's a perfect dessert to make for your loved ones, perhaps as an after school snack. Dani from High Walls made this recipe twice before it turned out how she wanted it, and we thank her for her perseverance. Sandee from La Receta de la Felicidad shares another take on the pinata trend with these super easy pinata cupcakes. The secret is the mold she uses to make the dome. She uses melting chocolate to make domes to put on top of cupcakes. She recommends that when you hand these out to kids at a party, they can use a spoon to crack open the shell and let the candy fall out. Sounds like fun! 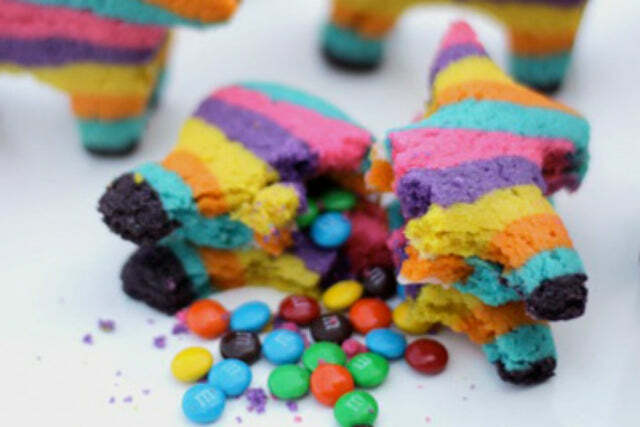 These rainbow burro pinata cookies aren't only super cute, they're traditional! The recipe for these rainbow burro pinata cookies seems like it's such a fun experiment, the kids might be able to lend a helping hand with this one! 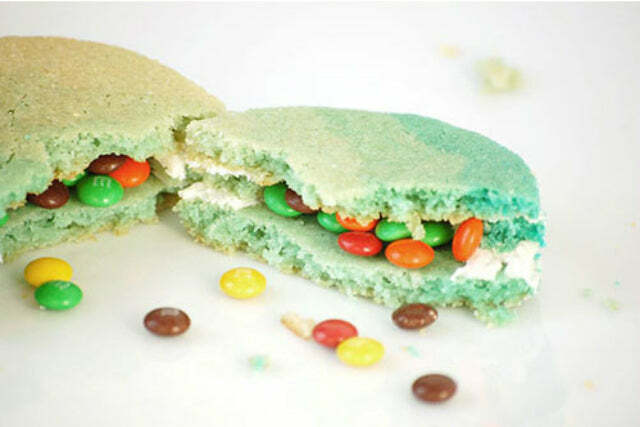 Sandra from She Knows shares this (kind of complicated) recipe that involves dying dough, freezing it, thawing it, baking it, and then filling it with M&M's. It's probably just easier to watch the video tutorial on the page below. Check out the instructional video here. Kudos to Lise from Mom Loves Baking for making a cake inspired by an abstract artist. To achieve the drip effect, Lise bought some multi-colored candy melts. It took 3 boxes of cake mix to make the three-tiered, 6-layer cake. While you would think that cutting holes in the cakes would be the most time-consuming, Lise says that it was the separating and coloring each layer of the cake. If you're not feeling as ambitious as Lise is (she's an ex-wedding cake baker) maybe opt for two tiers instead. Check out the incredible tutorial here! BRB, going to the store now. 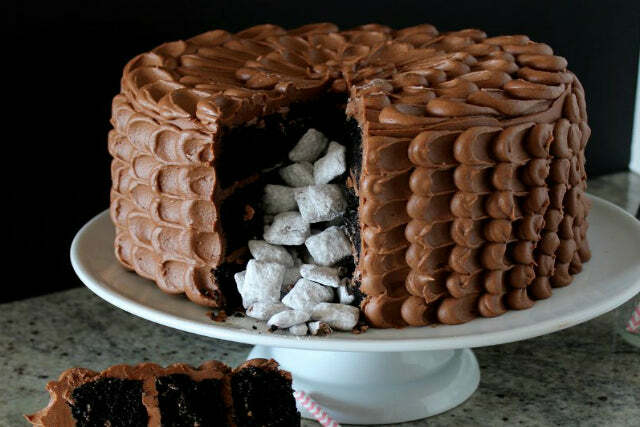 Really though, while we love the idea of putting candy inside of cakes, we are fascinated with the idea of putting muddy buddies (or puppy chow) inside of them. 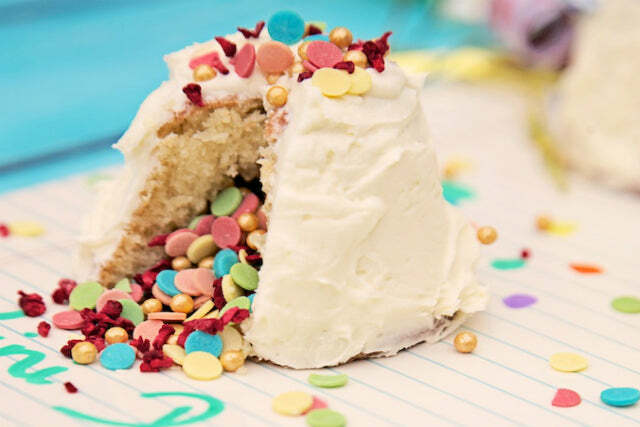 Aida from The Crafting Foodie says that making a pinata cake is really easy...but we think she might be biased. After all, look at this dark chocolate wonder and then take a look at her catalog. Clearly she's no cake newbie. Get more of the recipe and delicious photos here! Last but not least, we had to put in a healthy(er) version from Healthfully Ever After. The pictures are gorgeous, and the recipe is pretty simple. 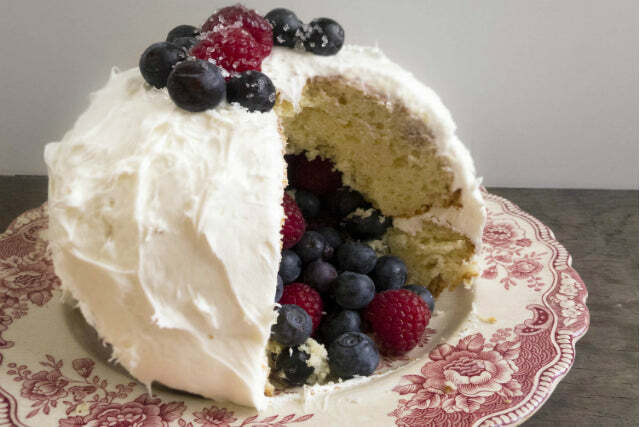 Carlene uses two Pyrex bowls to achieve this globular, berry-filled cake. Fill it with some fresh berries, cover it in icing, and you have a gorgeous cake for a bridal shower! Get the healthy recipe here! Learn the Tasty History of Chocolate This National Milk Chocolate Day! Looking for Easter Dessert Recipes? 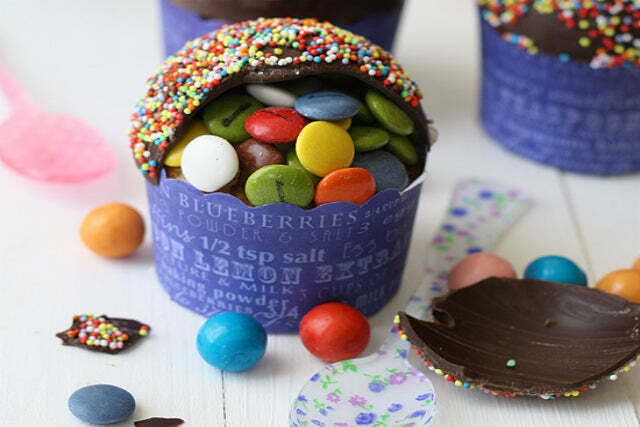 Try These 8 Adorable Easter Cupcakes! Love Chocolate? Try These 7 Recipes for Every Day of American Chocolate Week!